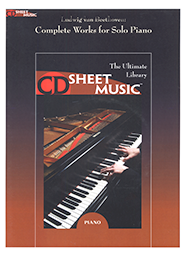 This CD contains sheet music for every piece that Johannes Brahms wrote for solo piano. Included are over 100 short works, Hungarian Dances for 2 and 4 hands, all Liebeslieder Waltzes, 3 sonatas, and 2 concerti - over 1000 pages of music. Brahms was born in Hamburg, Germany, in 1833 and died in Vienna, Austria, in 1897.